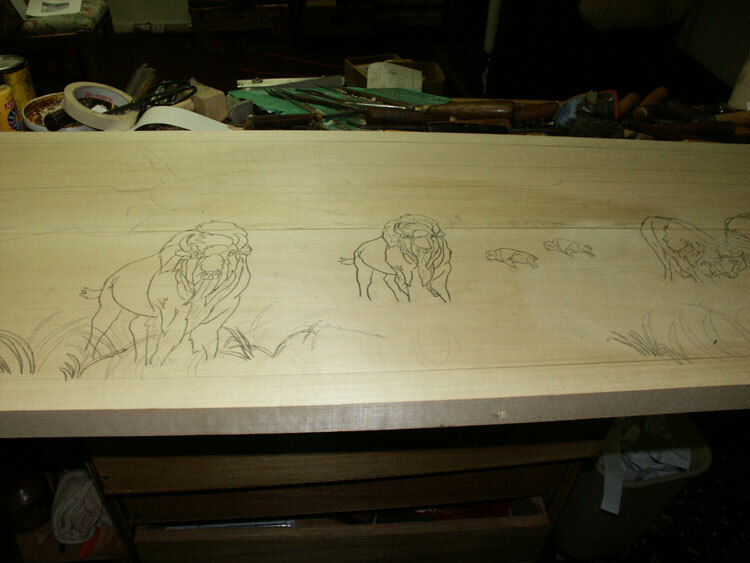 This project has been a LONG time in progress. 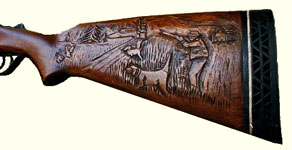 Conception occurred in 1995 when Eric commissioned a custom made 1874 Sharps, by Shiloh Rifle of Big Timber, Montana. 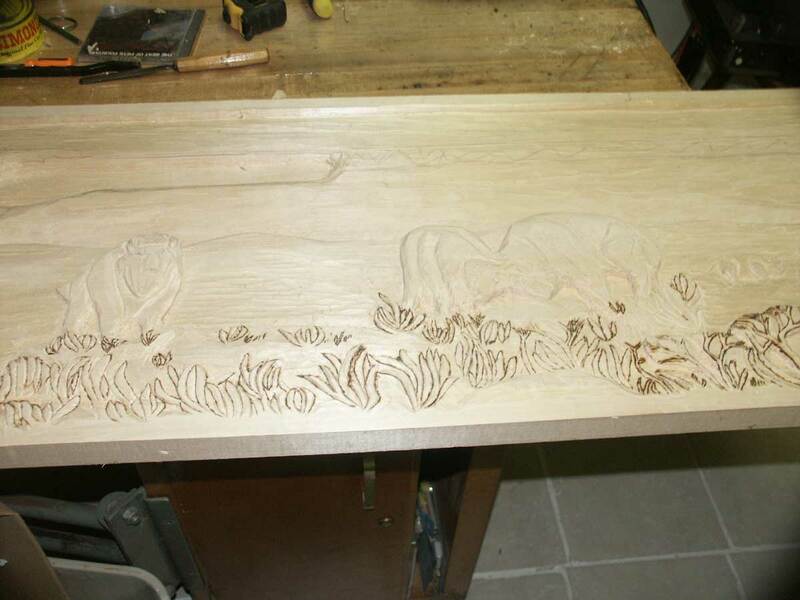 With a wait of over four years, he almost forgot about the piece. 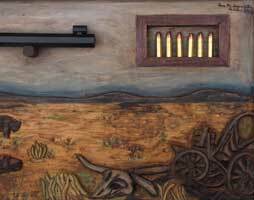 When it finally arrived, right around the turn of the millennium, Eric decided that this work of art really should be on display, but having a home remodel in progress the rifle was stashed away in the safe. 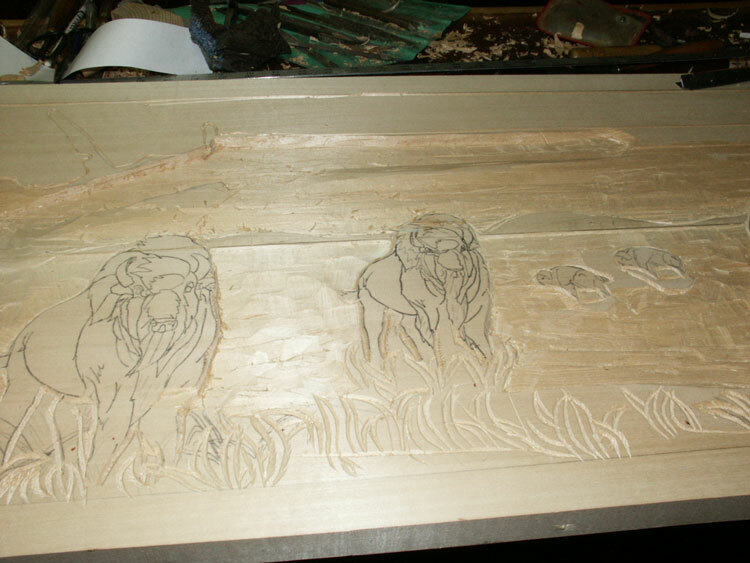 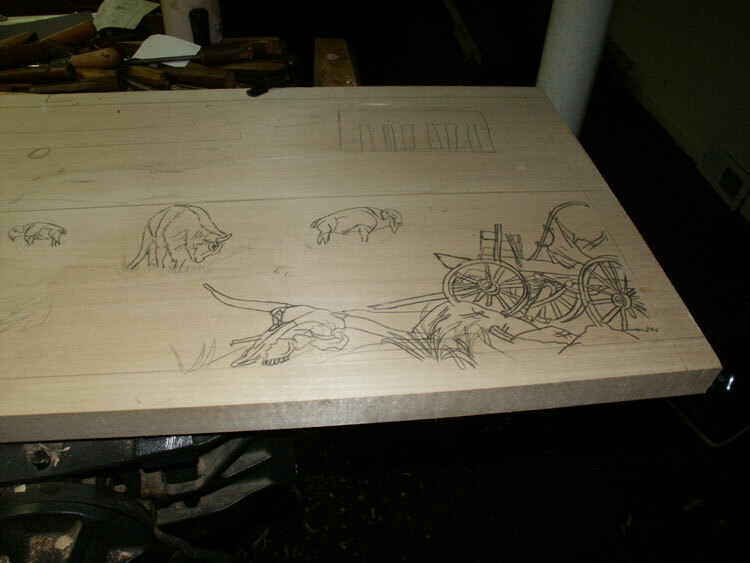 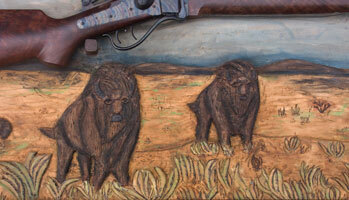 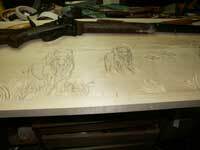 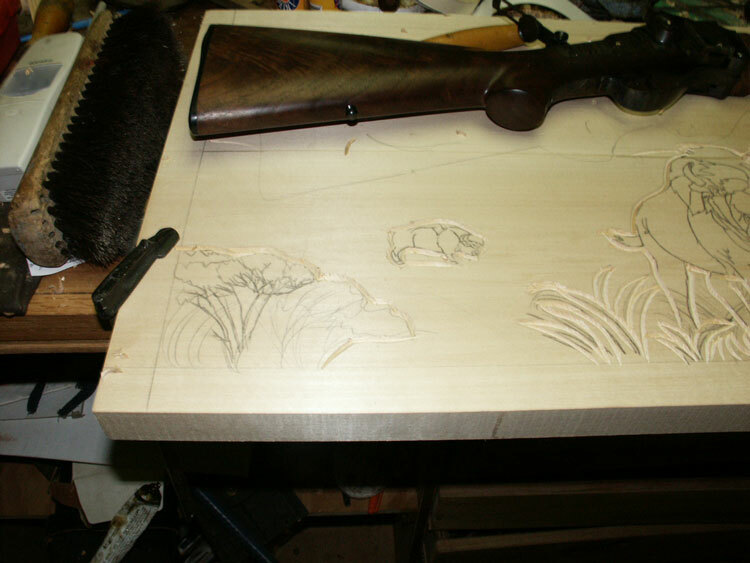 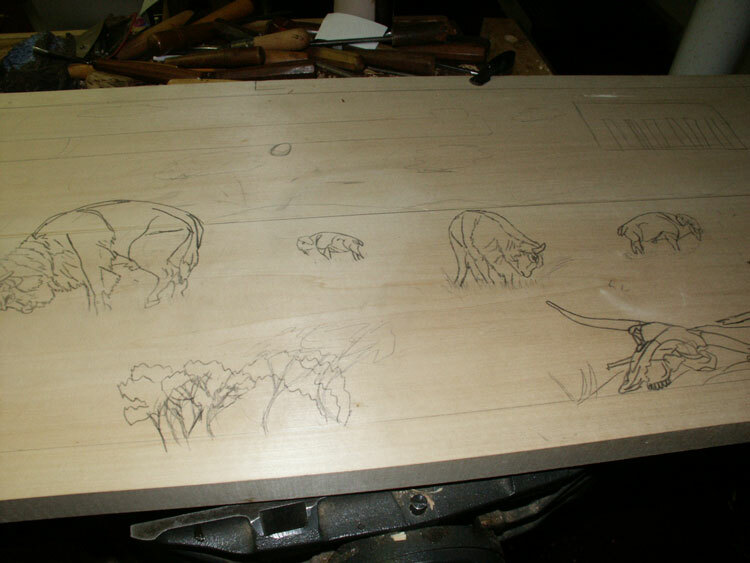 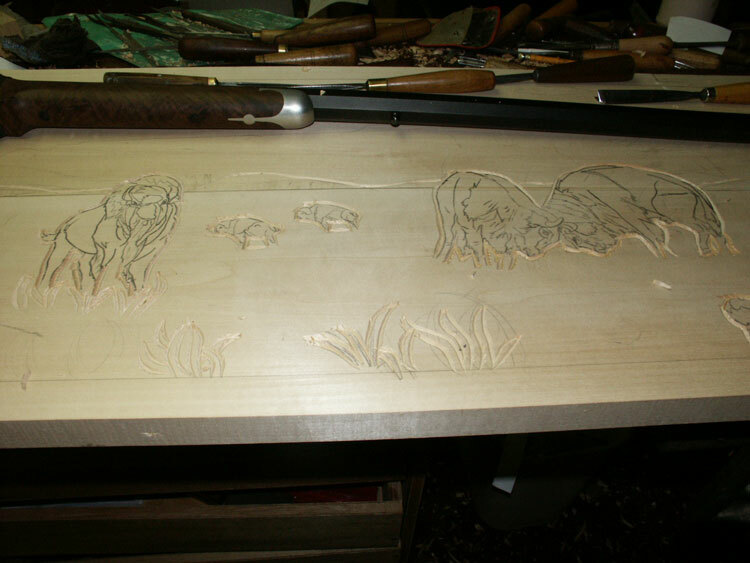 The challenge was to design a display panel worthy of the hand crafted buffalo rifle. After quite a bit of contemplation, give or take about two years, he decided to lay out a buffalo prairie scene, insetting the rifle into the horizon. 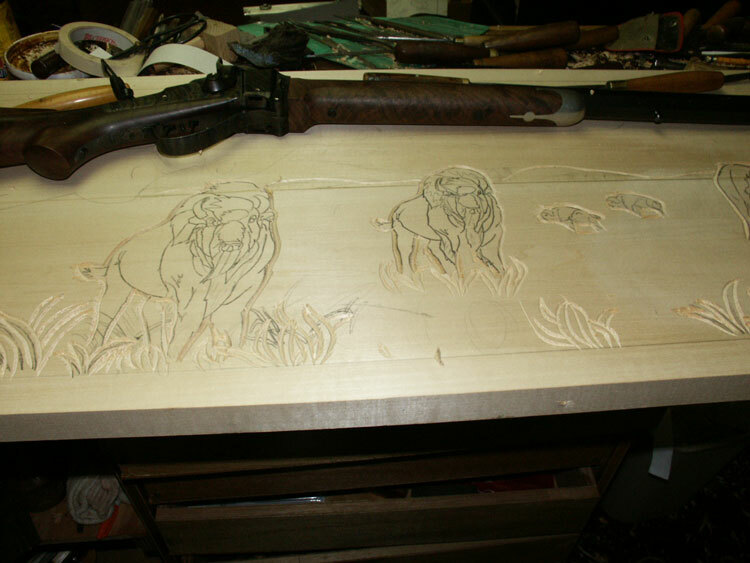 Now the decision was made, so Eric in character jumped right into the pattern development and carving somewhere around mid-2002. 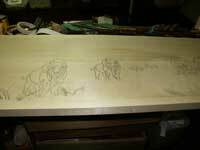 Just to point out the small gap in the timeline, in case you haven't noticed it's 2008, the end of 2008! 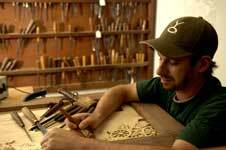 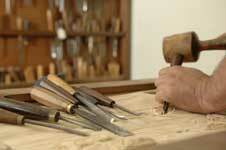 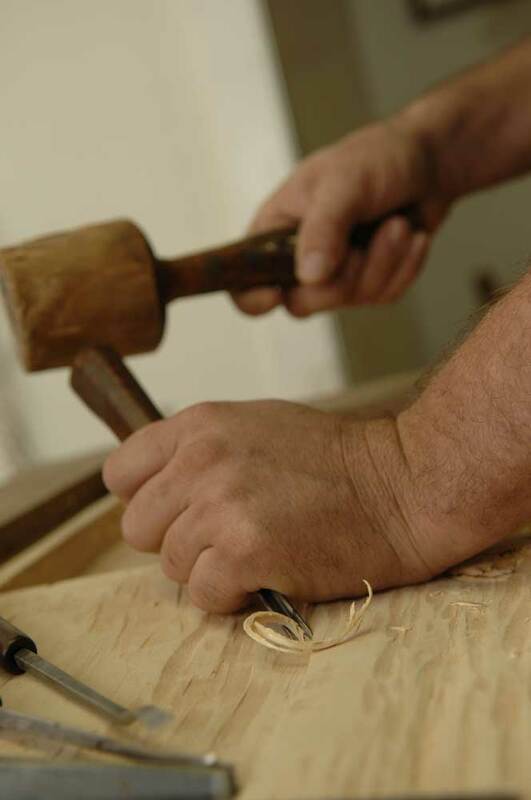 Artisans of the Valley re-established in 2001 under Eric's management, began to gain momentum. 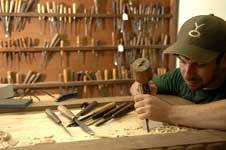 The ever expanding website, extended business to business relationships, feature articles and publicity, all played a roll with a consistent referral system. 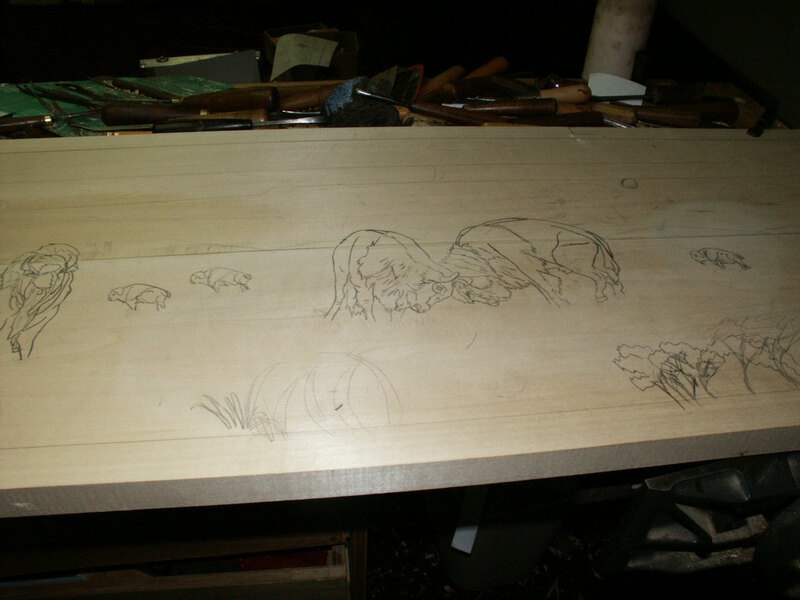 Artisans engulfed most of Eric's time so the panel sat, receiving moments of attention as the business leash allowed, none really. The fine detail is burned for clean lines, delicate grass, fur and texture, and for shadows. The scene is tinted with acrylic water colors, providing a natural spectrum of tones and shades. 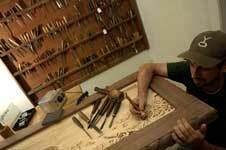 The frame is solid walnut, featuring a rope carving and natural tung oil finish. 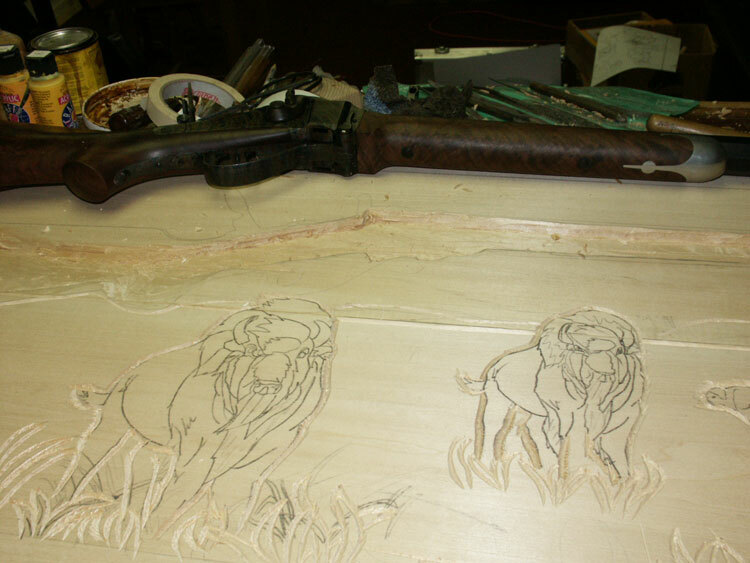 The rifle is mounted on two wood pegs, and secured in place with metal straps. 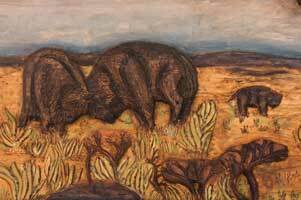 The panoramic scene for this project was derived from several designs created by renowned wildlife and pattern artist Lora S. Irish. 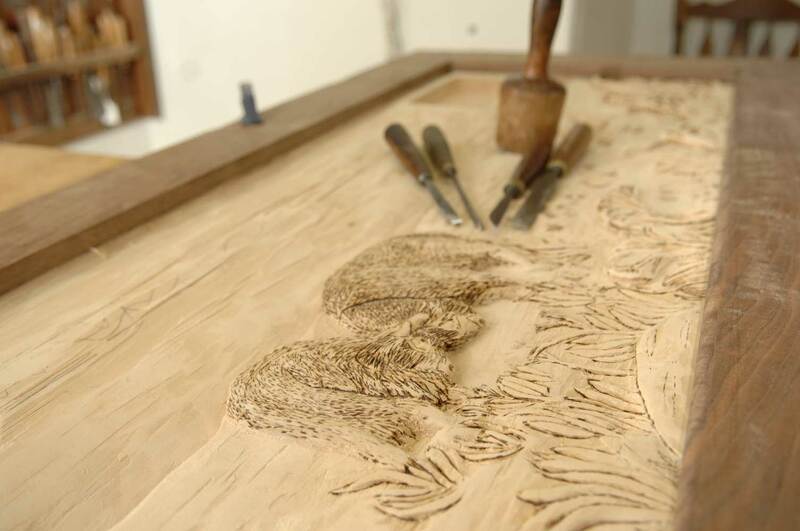 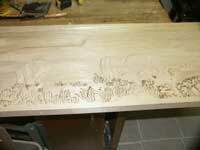 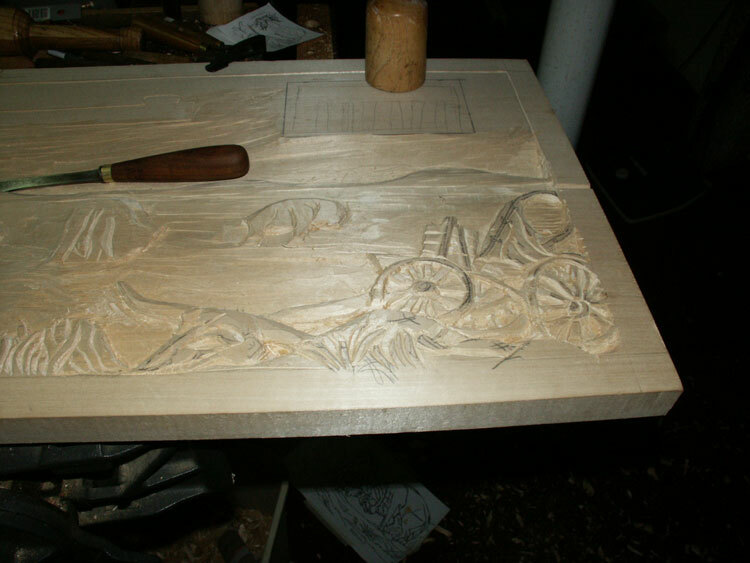 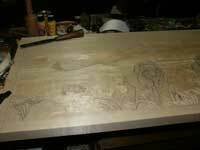 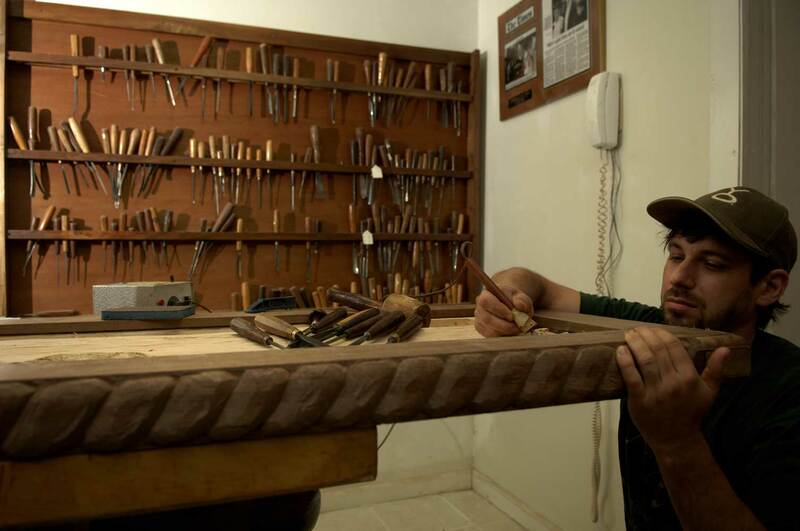 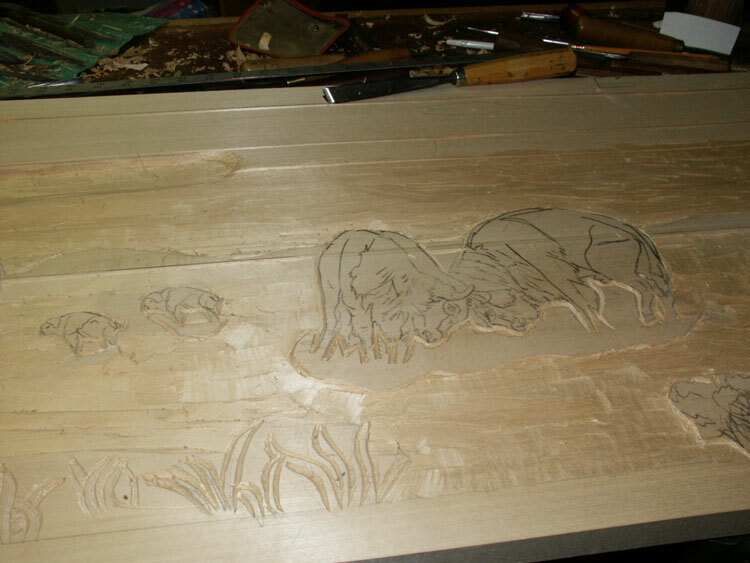 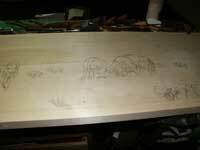 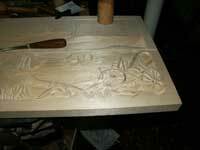 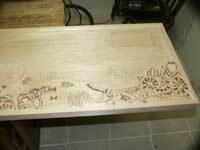 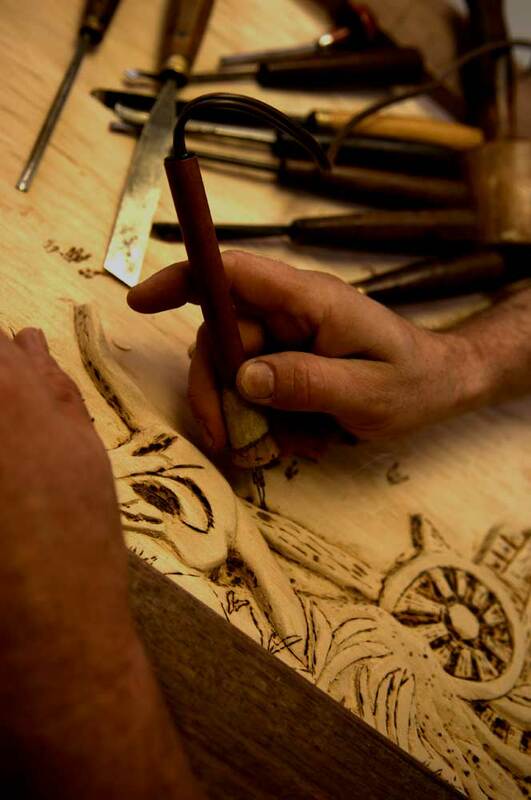 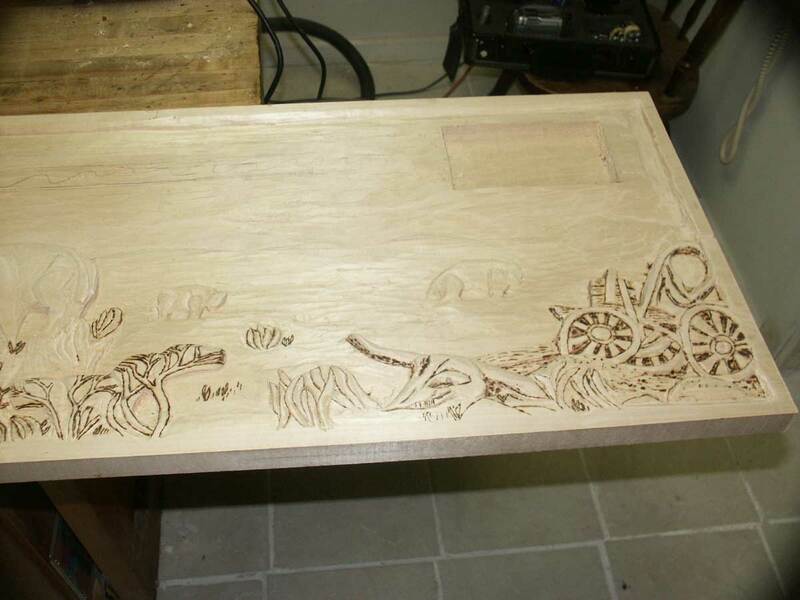 We should note that many of Artisans carving projects are based on Lora's ability to draw! 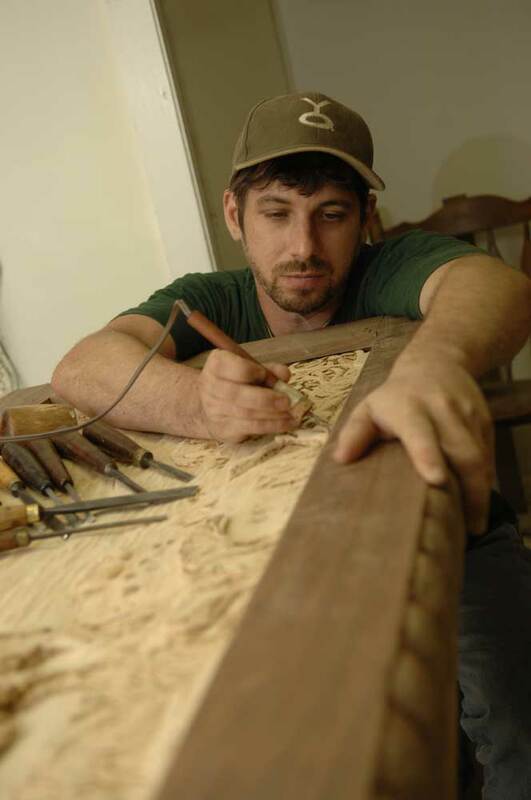 Photos Above by Greg Pallente were featured "Master of the Shop" October � 2007 Princeton Magazine / North Jersey Media Group. 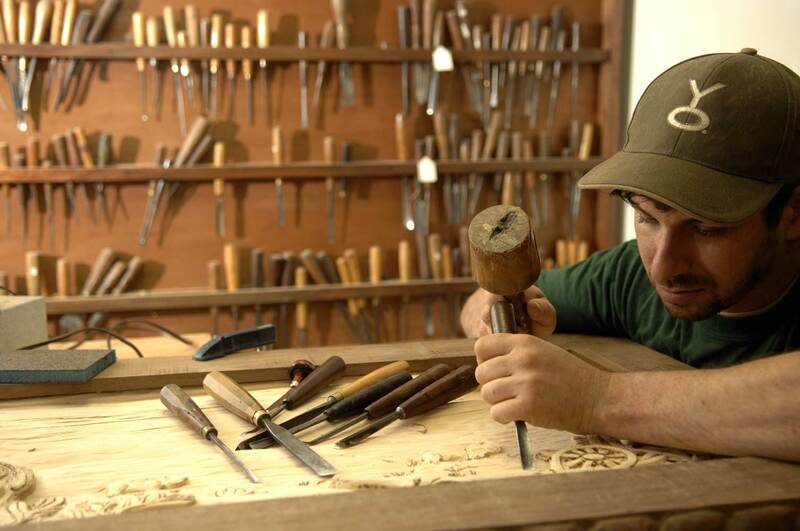 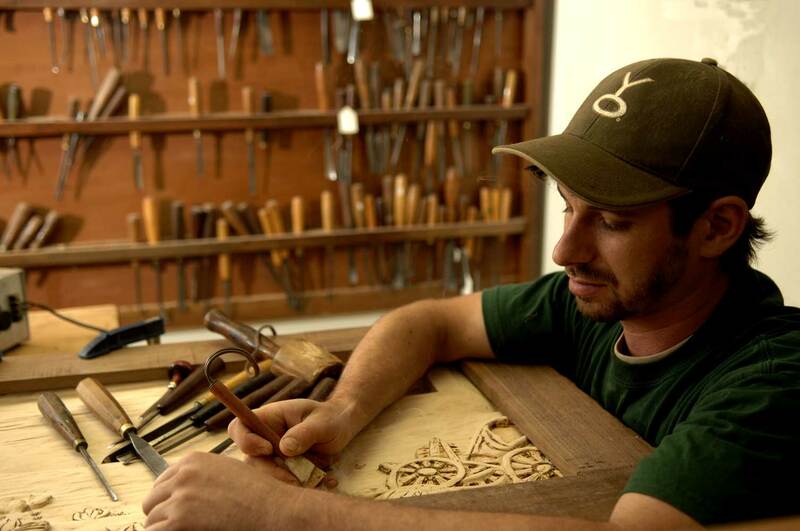 Check out this recent article featuring Eric Saperstein of Artisans of the Valley. 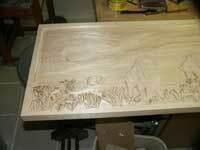 So as it stands, the fourth quarter of 2008 is upon us. 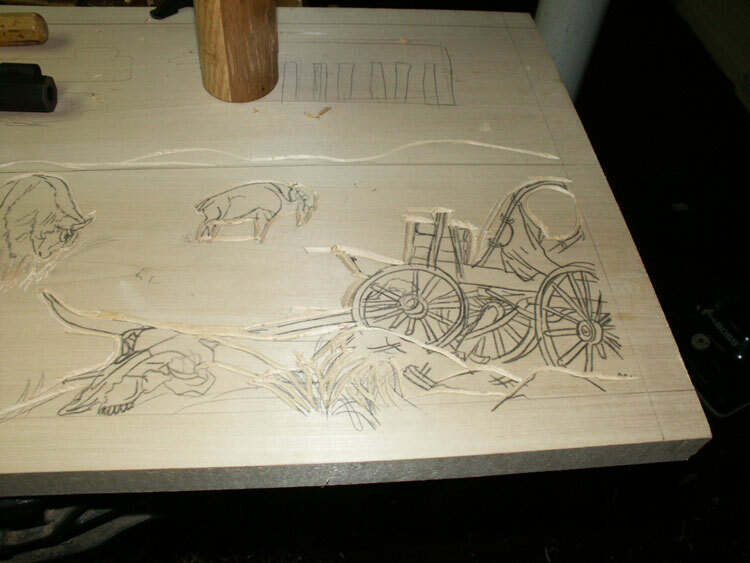 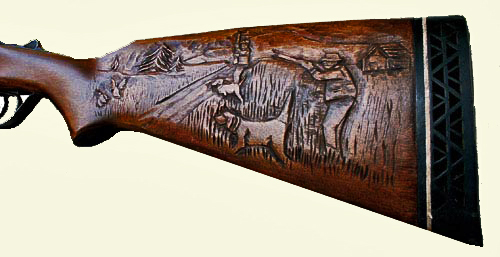 The Shiloh rifle is now proudly displayed in this deep relief basswood scene, "Shiloh Prairie." This piece is only the second formally titled panel, the first "Whitetail Sunrize" remains in the private collection of outdoorsman and musician Ted Nugent. 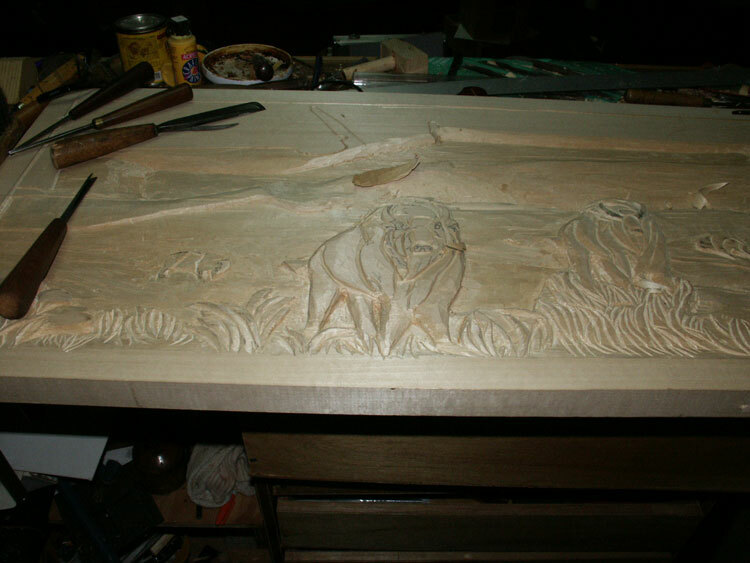 So what will the future of Eric's wildlife carvings bring? 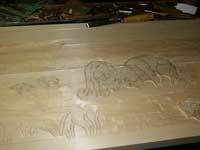 Well, we'll leak a little on our plans for next year; we intend to title more pieces, and we will make sure they gain notoriety in the worldwide art market! 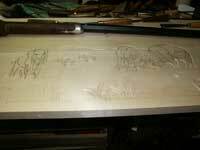 The shotgun (above) belonged to a hunting club member who left it, in damaged form, for a wall hanger. 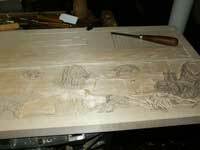 Artisans restored the piece to just shy of firing condition. 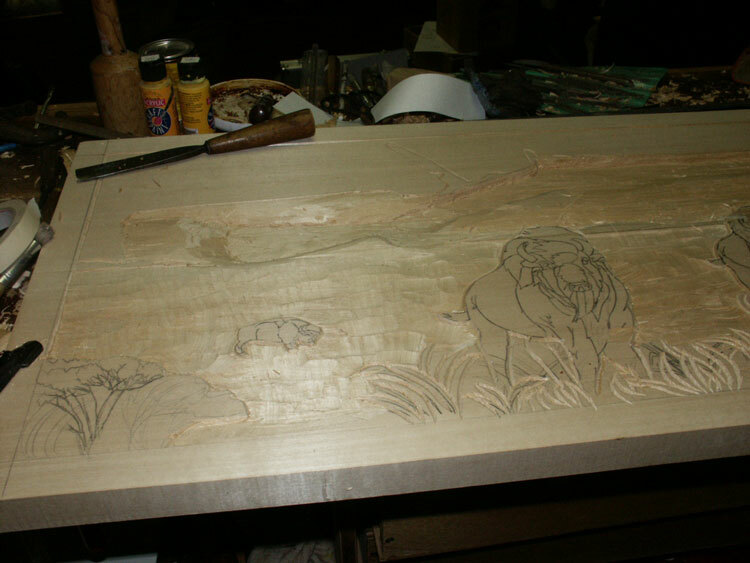 Cosmetic restorations are common on wall hangers, always best as demilitarized pieces for display only. 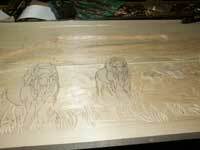 Also check out our Chainsaw Carving Section for Large Scale Wildlife Carvings of all sorts!